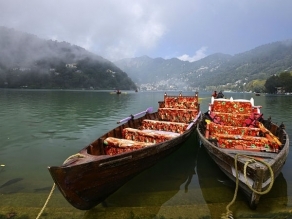 Nainital, also known as the 'Lake District of India', is located in the Himalayan Belt. 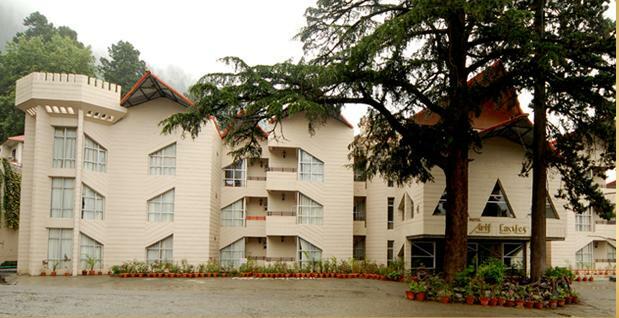 It is situated amidst the Kumaon Hills and is blessed with beautiful lakes. Nainital is referred to as 'The Lake of Three Sages' or the 'Tri-Rishi-Sarovar', in the Manas Khand (in the Skanda Purana). The three sages, namely Atri, Pulastya, and Pulaha, stopped at Nainital to quench their thirst. Unable to find any water, they dug a hole and filled it with water, brought from Lake Mansarovar. Thus, the famous Nainital Lake came into existence. Another legend states that the left eye of the Hindu Goddess Sati (wife of Lord Shiva) fell at this place and created the eye-shaped Naini Lake. Nainital is known as a paradise for tourists because of its beautiful landscape and serene surroundings. It is believed that the British merchant, P. Barron, made Nainital famous in 1839, when he established a British colony here, mesmerised by its beauty. Travellers planning a trip to Nainital can visit Hanumangarhi, which is famous for a temple dedicated to the Hindu Lord Hanuman. Besides, the Naina Devi Temple is an important religious site, which is counted amongst the 51 ‘shakti peeths’ of India. Visitors can go for a picnic at the beautiful Kilbury, located around 10 km away from Nainital. 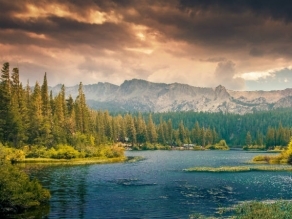 The lush-green oak, pine, and rhododendron forests make it a perfect destination to relax amidst nature. It is a habitat for more than 580 species of colourful birds, which include brown wood-owls, collared grosbeaks, and white-throated laughing thrushes. The Lariakanta, perched at an elevation of 2481 m above sea level, offers splendid views of the entire region to visitors. This is the second highest peak of Nainital, located at a distance of 6 km from the town. The Land's End is the perfect place to enjoy the mesmerising views of the beautiful Khurpatal Lake. 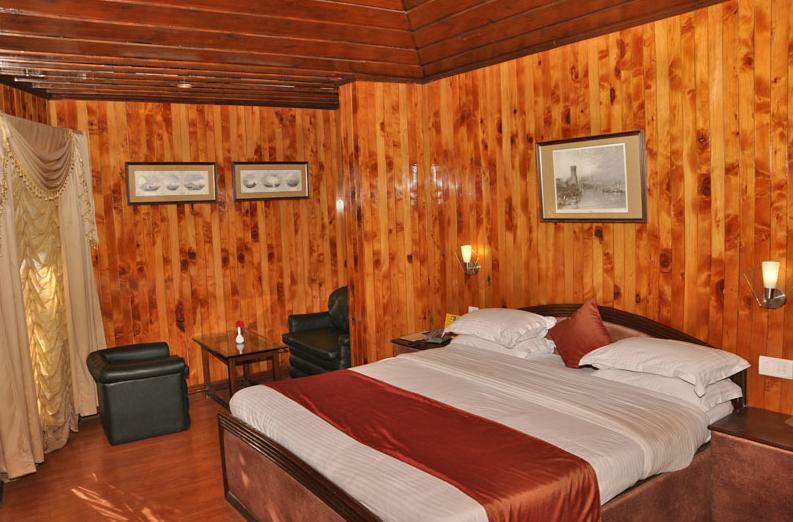 It also offers panoramic views of the lush-green valley and hills surrounding Nainital. Tourists can travel by ropeway to reach the hilly locations of the destination. The ropeway covers a total distance of 705 m and each car of the ropeway can accommodate a maximum of 12 persons. The Snow-View is easily reachable by ropeway and is an ideal vantage point, from where tourists can admire the beauty of the Himalayan ranges. The Naina Peak, also known as the China Peak, is the highest peak of Nainital. 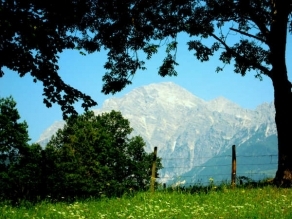 It is located at an altitude of 2611 m above sea level and can be reached by horse riding. The Tiffin Top or the Dorothy’s Seat is an ideal picnic spot, where tourists can spend a leisure time with unlimited fun. This site was developed by the husband of Dorothy Kellet (an English artist) after her death in a plane crash. The Eco Cave Garden is another popular tourist attraction of Nainital, which introduces visitors to eco-friendly lifestyle. The Raj Bhavan, Zoo, The Flatts, The Mall, St. John in the Wilderness Church, and Pangot are the other major tourist attractions of Nainital. The Thandi Sadak, Gurney House, Khurpatal, Guano Hills, and Aurobindo Ashram are also worth visiting. Besides, tourists can indulge in various activities, like Horse Riding, Trekking, and boating, among others. Nainital is well connected by road, rail, and air to different parts of the country. The summer season is considered ideal for visiting this beautiful destination. Tourists can avail private and public bus services to reach Nainital. Besides, private Volvo buses are available to Nainital from Delhi. Semi-deluxe and deluxe buses are also available from Almora, Ranikhet, and Badrinath to Nainital. The Kathgodam Railway Station is the closest railhead to Nainital, which is located at a distance of 23 km. This railway station is well connected to Lucknow, Agra and Bareilly by direct trains. Visitors can hire a taxi from this station to reach Nainital. The Pantnagar Airport is the nearest air base to Nainital, which is located at a distance of 55 km. This airport is connected to the Indira Gandhi International Airport of Delhi by frequent flights. Besides, it is connected to all the major destinations of India. Taxis are available from this airport to Nainital. Tourists can also take flights to the Jolly Grant Airport of Dehradun, which is located at a distance of 251 km from Nainital. They can even travel to the Kheria Airport of Agra, which is situated at a distance of 299 km from Nainital.